I’ve had this book on my shelf for a while, and when a BookTuber I follow selected it as the January pick for her online book club, I thought I’d read along. Full disclosure – We Need to Talk About Kevin is disturbing, and it will not leave you with warm fuzzies of any kind. The novel unfolds through letters from Eva to her husband, Franklin, so we approach the story entirely from her point of view. Right away I wasn’t a fan of the epistolary format, and the first 50 pages were slower than I’d prefer. However, there is a threshold somewhere around the 50-page mark that shifts the pacing dramatically. It took me weeks to crawl there, but once I crossed over, I couldn’t put down the book and ended up finishing it in a weekend. It isn’t a spoiler to tell you about Kevin. From the start, he is a different sort of child. He’s curt and ominous as if there was a dark streak in him from birth. That’s why, when, at 15 years old, Kevin murdered a handful of classmates, a cafeteria worker, and a teacher, and subsequently lands in jail, you aren’t surprised. You knew it was coming, and it was only a matter of knowing how you wound up there. The letters from Eva to Franklin are heart-wrenching, particularly because Eva knew there was something off in her son. Franklin, less so. 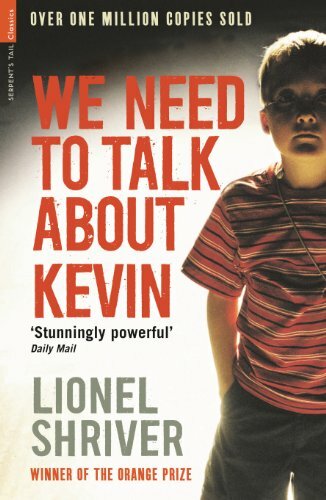 As their disenchanted lives unfold in the suburbs, Eva becomes increasingly worried about Kevin, and he is well aware of her concerns. Kevin enjoys and exploits them. We Need to Talk About Kevin is… unnerving. It is not a beach read or a cozy mystery. It is troubling and shocking and terrifically sad. And yet, it is so well done that Lionel Shriver must have dug deep into the dark minds of young murderers in order to write one so perfectly. Winner of the Orange Prize and numerous other accolades, Shriver is an impeccable writer and storyteller. That being said, don’t expect a happy ending.